This is a distance online learning program which students can enrol into at any time. The program is designed to allow students to study anywhere. There is no need for you to have hard copy materials with you, as long as you have an internet connection, then you can start this course today. If you want hard copy resources posted to you, we can arrange this for you too. The below table covers the Health & Safety program topics and the subject areas which will be covered. GET SKILLED = this program offers students the opportunity to participate in all the learning activities, develop knowledge, learn the skills within this program. You have the option to complete assessments and get feedback to reinforce your learning. At the end of your learning program, you’ll be issued with a Training Aid Australia GET SKILLED Certificate of Completion. 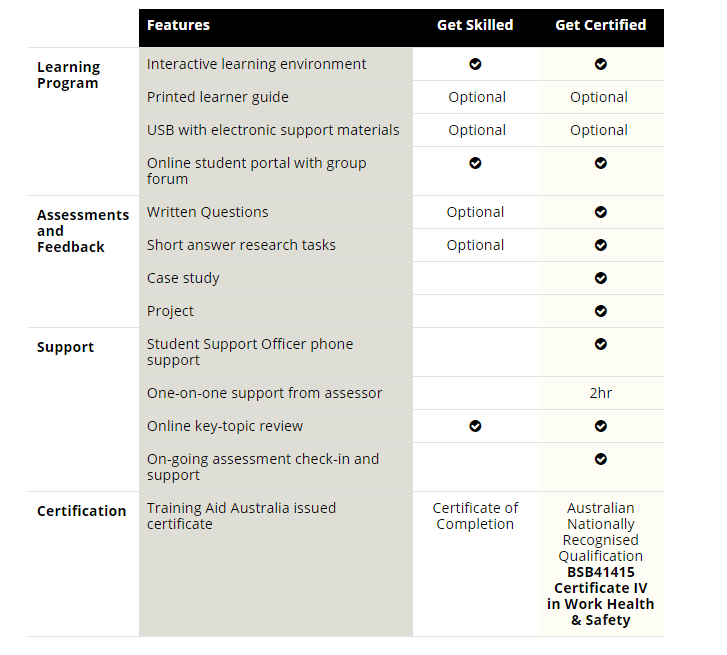 GET CERTIFIED = this program includes all the “GET SKILLED” components, then has required assessments for the opportunity to obtain an Australian Nationally Recognised Qualification – BSB41415 Certificate IV in Work Health & Safety (WHS). If you are interested in the GET SKILLED program, then you simply need to enrol into the program and commence your studies. If you are interested in the GET CERTIFIED program, then register your interest by clicking on the below button and a student support officer will contact you to discuss your preferred program. 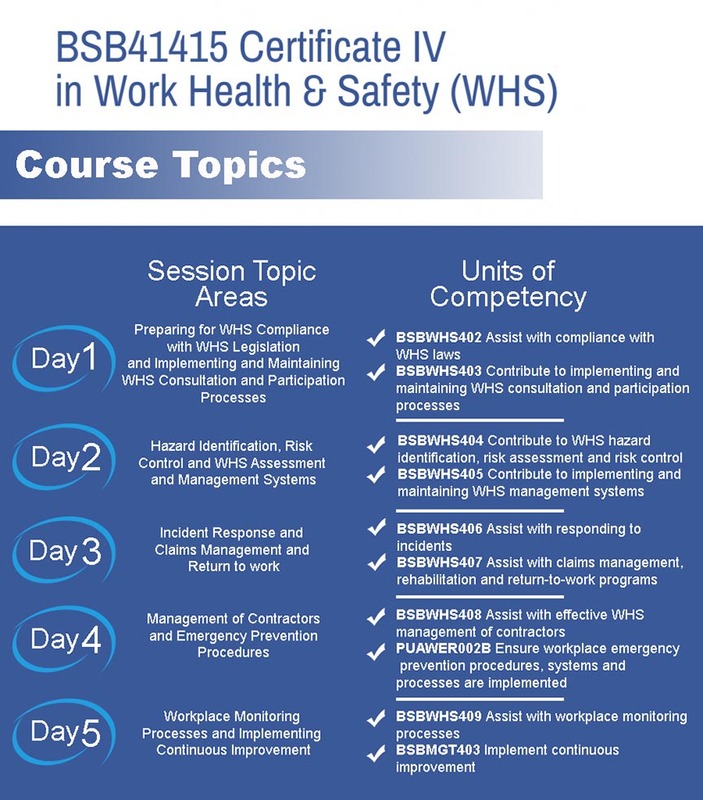 This course is suitable for all people around the world who are working in a work health and safety (WHS) role who may or may not work under supervision. They may provide leadership and guidance to others and have some limited responsibility for the output of others. The program reflects the role of workers who apply a broad knowledge base and well-developed skills in a wide variety of contexts and may include coordinators, advisors and facilitators. The knowledge & skills developed in this program are transferable to all workplaces, in any country. This course requires that students have fundamental Language, Literacy and Numeracy (LLN) skills. For full details, please refer to the Course Description PDF.